This Basil? No....not this Basil! Basil is the most widely used herb in the world and a FAV among edible landscapers! We knew there was a reason we loved it…from its beautiful (no, it doesn’t only come in green!) foliage to its fragrant flower, this herb can multi-task…a brilliant culinary herb…a versatile addition to the landscape with many very different ‘looks’. This is a hot herb!! Folklore says that when a man presents a woman with a sprig of basil, she will fall in love with him and never leave him! 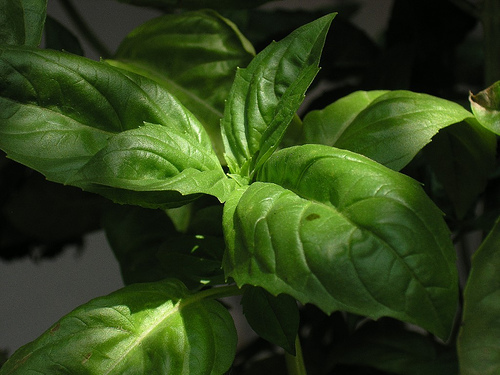 Basil, originally from India, is used for seasoning many Italian dishes and is the main ingredient in pesto sauce. It is easily grown and is best started from seed. There are over 160 varieties of basil. A favorite of edible landscapers, they can be grown in the vegetable garden, used as an attractive addition in perennial or annual beds, or in pots on a sunny windowsill. Although not research-based, companion planting with basil is said to repel insects such as aphids, mites, tomato hornworms and asparagus beetles. Whether true or not, basil looks great inter-planted throughout the entire garden. Basil should not be transplanted into the garden until the daytime temperature is consistently in the 70s, and the nighttime temperatures are above 50 ºF. If a late frost is expected, the plants can be covered with pine straw, inverted pots or buckets until the temperature rises the next day. To grow any cultivar of basil, choose a sunny site in the garden. Although basil prefers full sun, it grows reasonably well in part-sun (six hours of sun per day). Before the first fall frost kills the basil, plants can be cut back for harvest, and the root systems dug up and potted in containers for continued growth indoors. Put plants in a sunny window. Water the plants regularly, but do not over-water, and do not let the plants stand with water in their saucers. Basil thrives in rich, well draining soil with a soil pH between 6.0 and 6.5. This is also the best pH range for most vegetables. Add organic matter, such as compost, manure or composted pine bark, into the garden soil before planting, as basil grows best in a rich, well-drained soil. The addition of organic matter will improve the ability of sandy soils to hold water, and aid in water drainage within clayey soils. It also greatly improves the ability of the soil to hold onto fertilizers. Basil plants should not be over-fertilized because the flavor in the foliage will be reduced during rapid plant growth. A soil test is always recommended before planting a garden to be sure the correct amount of nutrients is added. In the absence of a soil test, evenly spread 3 pounds (3 pints) of 5-10-10 organic fertilizer per 100 square feet of garden before planting and mix the fertilizer into the soil. Approximately two months after planting, the basil may be fertilized again if plant growth is reduced and foliage color has become paler green. Evenly apply some gypsum over the garden and water in the fertilizer. Gypsum is a good source of calcium and also improves the texture of heavy soils without effecting soil pH. Commonly used organic sources of nitrogen, phosphorous, and potassium are bloodmeal, bonemeal, and soybean meal. 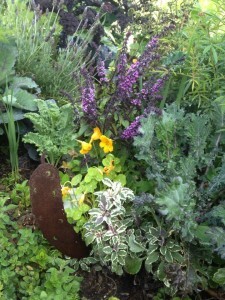 Many gardeners choose to use poultry litter or commercially available poultry-litter based products. For example, a 3-2-3 or 3-2-2 poultry litter product can be applied before planting. A blended fertilizer or bonemeal mix (10-10-10) can also be used. A liquid fish-emulsion and seaweed product (average analysis of 4-1-1) may then be used for sidedressing. I stress that just by adding organic matter such as manure or compost to the soil you will increase the level of nutrients, improve soil microbial activity, and increase water-holding and nutrient-holding capacity. Organic matter also improves the physical condition or texture of the soil for cultivation and improves soil structure so the surface of the soil does not crust. Any soil can be/should be improved through the addition of organic matter. As HGEL has often advised, cover crops are also an important, inexpensive way to add organic matter to the soil, and much of plants N needs can be met via cover cropping. The terminal growth of basil plants may be pinched out periodically to encourage branching. This will create thicker plants with more tender foliage for harvest. By mid-summer, many cultivars of basil will begin producing flower spikes. For the most flavorful foliage, flower buds should be pinched out as soon as they appear. However, some cultivars have more colorful flowers of purple or pink, and these may be left if the plants are grown more as an ornamental. Some flower spikes may be allowed to develop if seed is to be collected. 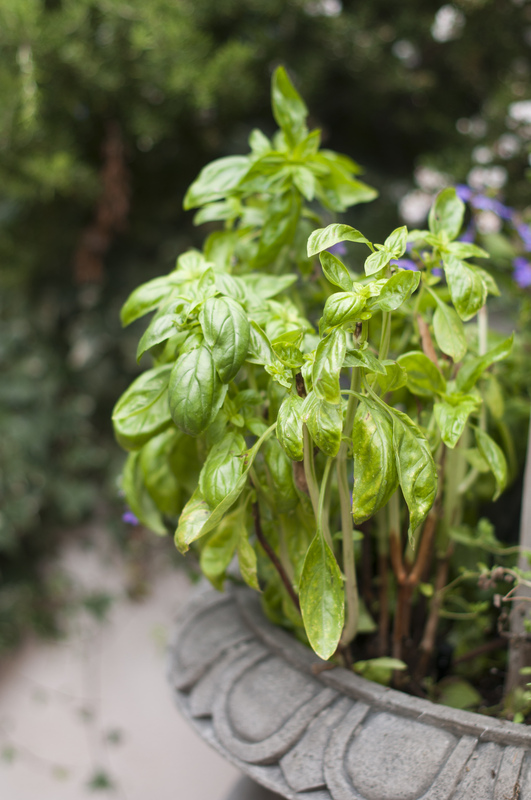 Although basil plants need well-drained soil, they still need a relatively constant supply of soil moisture. Mulch the plants with pine needles or ground up leaves to a depth of 3 inches. This will help maintain a more constant soil moisture level, keep the foliage clean from rain-splashed soil and reduce the occurrence of weeds. It is best to water by soaker hoses, drip irrigation or by hand at the base of each plant. Do not wet the foliage, as it will be more prone to disease. Weed control is one of the most difficult management problems facing organic vegetable growers. Before planting, weeds can be reduced through use of crop rotations and cover crops. Try to rotate crops with different growth habits, warm and cool season crops, and crops grown in wide and narrow rows. On small plantings, organic mulches, such as straw or grass clippings, can help shade out weeds between the rows. *Bush basil – ocimum basilicum var. minimum … This variety of basil has small leaves and is more tolerant of different growing conditions. It can also be grown in a pot. Its also an annual but only grows to about 15cm in height. This variety of basil can be used for culinary purposes. * Camphor Basil – ocimum basilicum var. kilimandscharicum … This variety of basil was named for Mount Kilimanjaro and can be used medicinally as a tea for colds and stomach ache. Its ideal for clipping making it versatile enough to be trimmed into a small hedge or topiary. * Zulu basil – ocimum basilicum var. urticifolum … This variety of basil has lemon-scented leaves. * Purple Basil – ocimum basilicum purpureum … This variety of basil has dark purple leaves and pale pink flowers and is mainly used as an ornamental plant. * Purple Ruffles Basil – ocimum basilicum ‘Purple Ruffles’ … This is a very attractive and unusual ornamental variety of basil with ruffled edges to the maroon leaves. * Green Ruffles Basil – ocimum basilicum ‘Green Ruffles’ … Another ornamental variety of basil similar to ‘Purple Ruffles’. Again leaves are ruffled and this variety has lime green leaves. 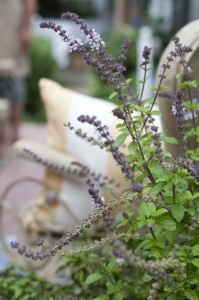 * Lemon Basil – ocimum basilicum var. citriodorum … This is another lemon-scented variety of basil and is generally smaller and a more compact plant. * Sacred Basil – ocimum basilicum ‘Sanctum’ … Hindu’s regard this variety of basil as sacred and as such it is used in worship. The leaves are gray-green and coarse and it has lavender flowers. * Perennial Basil – ocimum basilicum var. gratissimum … The leaves of this basil variety can grow up to 15cm in length. This variety is classed as a shrub and can grow up to 2m in height. * Lettuce Leaf Basil – ocimum basilicum var. crispum … A large-leafed variety of basil that is ideal for salads and has crinkly leaves and white flowers. * Thai Basil – ocimum basilicum ‘Thai’.. This variety of basil has a slight liquorice flavour and aroma and is used in many oriental dishes. 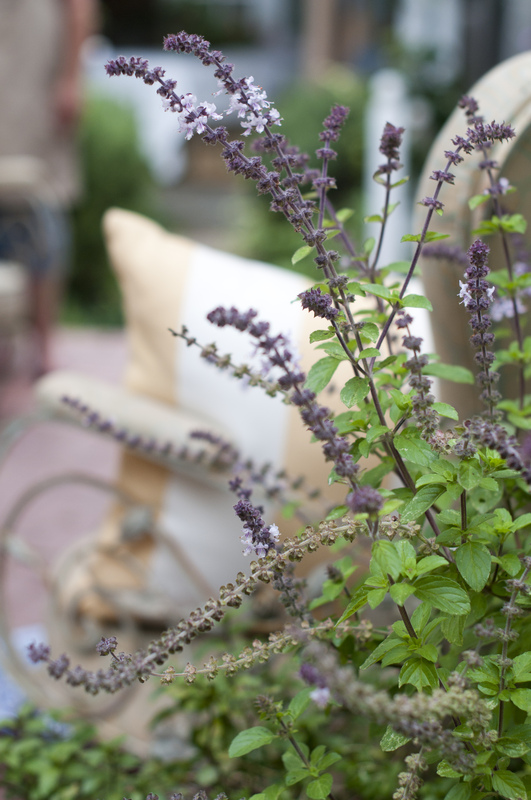 ‘Anise’ Basil, originally from Persia, has a decorative purple flush to it’s foliage and light pink flower spikes. The flavor and aroma are anise or licorice like. Grows to 18″ tall. Bushy plant with ovate, glossy, bright green and sometimes purple leaves often with a toothed edge to 2″ long. Flowers grown on spikes should be removed as they take too much energy away from the plant. Used for cooking, especially Italian and Thai dishes. You can use Cinnamon Basil in any recipe that calls for basil. The sweet flavor is very good when used with other fruity flavored herbs. Pick the leaves and use them in cooking or put them in bottles of olive oil to make cinnamon-flavored oil. The oil would be good to use for frying apples or bananas. You can add this herb to your apple pie fillings, and it tastes great added to an apple sauce or raisin sauce for pork or ham. Cinnamon Basil can be used to make a refreshing tea. Prevention of disease through good cultural practices is the most effective means for healthy crop production. To help prevent foliar fungal diseases, keep foliage as dry as possible by watering early in the day so foliage dries quickly, or by using drip irrigation. To reduce soil borne diseases, rotate herbs to different parts of the field each year and remove and destroy all plant debris after final harvest. A devastating basil wilt disease caused by a soilborne pathogenic fungus, Fusarium oxysporum f. sp. 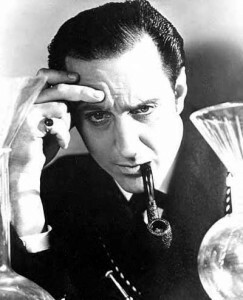 basilicum, was first discovered in the U.S. in 1991. Plants infected with this disease usually grow normally until they are six to twelve inches tall, then they become stunted and suddenly wilt. Initial symptoms usually include brown streaks on the stems, discoloration of the internal stem tissue, and sudden leaf drop. Interestingly, only sweet basil is affected. Some of the specialty basils, such as lemon basil and purple basil, show some resistance to the disease. No fungicide has been proven effective. In an organic system pest and disease management is based on prevention. The goal is to have a healthy, balanced plant and soil system in which pest populations will be stay within tolerable limits. In a conventional system, synthetic pesticides may help a grower save the current crop from an immediate pest problem; however, in many cases, the problem recurs or another develops. The organic approach is based on the theory that major pest problems usually occur when something is out of balance in the system. This is system is well-suited for organic production and one, as a Master Gardener, I always recommend. IPM is a system in which insects, diseases, and weeds are closely monitored, and different methods are used to keep pest populations at levels that are not economically damaging with minimal adverse environmental effects. IPM encompasses use of cultural and biological control methods, use of resistant varieties, and judicious use of pesticides. When pesticides must be used, an effort is made to select ones with low toxicity, non-persistent residues, narrow spectrum of control, and low environmental impact. There is no guarantee that, once an organic system is established, there will never be a disease, weed, or insect problem. Stressful conditions that a gardener cannot control will occur, such as weeks of endless rains, droughts, periods of extremely high temperatures, hurricanes, plagues of grasshoppers, or hail. Likewise, if an airborne disease invades your area, your plants will probably be infected. However, with careful observation and preparation, an organic system should progressively have fewer pest problems as years go by. Basil leaves may be harvested individually or the ends of branches can be pinched off with one or two sets of leaves. Leave enough foliage on each plant after harvest so that plant growth is not significantly reduced. If larger quantities of basil are anticipated for the season, choose cultivars with larger leaves for a less time-consuming harvest. Harvested basil leaves do not store long, even under refrigeration. The optimum storage temperature is 40 to 45 F. Lower temperatures may cause discoloration. Alternatively, the foliage may be air-dried or dried in a food dehydrator at less than 125 ºF until leaves are dry. Also, small bundles of cut stems with foliage may be hung upside down in a warm, well-ventilated room to dry. Crumble the completely-dried leaves and store in small, air-tight containers for up to 12 months. For a dried finished product, wash leaves, spread on screens, and sort out weeds and blossoms. To retain maximum color, circulate warm air (less than 130 F) around the leaves until dry. Sun-dried leaves tend to be brownish. Store in air-tight containers in the dark. For essential oil production, cut basil should be field dried for 1-3 days prior to collecting and distillling. You can also freeze the leaves in an ice cube tray with water. Then pop them out after they freeze and store them in a plastic bag in the freezer. Drop these herb cubes into soups or sauces to add basil flavor. Thanks for taking the time to let me know, Tara! Glad you enjoyed it! Happy Gardening!